Nothing excites soon-to-be parents than their first OB-GYN (Obstetrics/Obstetrician Gynecology) appointment to see their unborn child live at the screen, and get a copy of the sonogram to be kept at the child’s personal album. This is made possible through the use of traditional ultrasound scanners which utilizes piezoelectric crystals. Technically, piezoelectricity (also called the piezoelectric effect) is the appearance of an electrical potential when you subject it to mechanical stress. This is used to create images of the inside of a body and sends the data to a computer for processing to produce sonograms. But engineers were not satisfied with the cost of the machine and the power it consumes. Because of this, they improved the existing one by creating another machine that’s more compact, consumes less power, and could deliver the same performance. The researchers at the University of British Columbia have developed a new transducer probe. It is smaller than a band-aid, wearable, and it could be powered by a smartphone. They call it the polyCMUTs (polymer capacitive-micro machined ultrasound transducers). It is composed of tiny vibrating drums made of polymer resin. 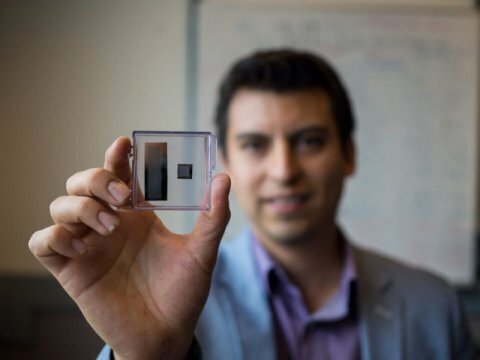 According to Carlos Gerardo, a PhD candidate in Electrical and Computer Engineering at UBC, by using polymer resin, they were able to reduce the cost significantly, using fewer processes and minimum amount of equipment. Another good thing about this innovation is that it could be powered using only 10 Volts, thus, making it possible for a smartphone to power it. Co-author Edmond Cretu, a professor of Electrical and Computer Engineering, mentioned that unlike the rigid traditional ultrasound machines, the transducer they built can be wrapped around the body for easier scanning and more detailed views. Robert Rohling, also a professor at the same university, said that there are still a lot of steps to be taken before this innovation that has been brought to light could be used in clinics and hospitals. The documents and all the actual testing are under way and they mentioned that they are building prototypes for the said tests. On a positive note, he mentioned that there are a lot of doors that were opened due to this invention and one of which is that it could be strapped directly onto someone’s chest and do live monitoring.